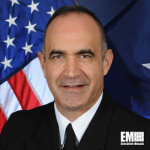 President Barack Obama has nominated U.S. Navy Rear Adm. Charles Richard, director of the undersea warfare division (N97) at the Office of the Chief of Naval Operations, as deputy commander of the U.S. Strategic Command. Richard is also in consideration for a rank promotion to vice admiral and will be based at Offutt Air Force Base in Nebraska once confirmed, the Defense Department said Thursday. Richard currently manages the planning, programming and budgeting functions for the submarine force’s acquisition, operational readiness and modernization in his role as undersea warfare division director. He has held a number of military leadership roles including as executive assistant and naval aide to the undersecretary of the Navy, chief of staff in the Submarine Force Atlantic, Submarine Squadron 17 commander, a member of CNO’s Strategic Studies Group XXVIII and deputy commander of Stratcom’s Joint Functional Component Command for Global Strike.